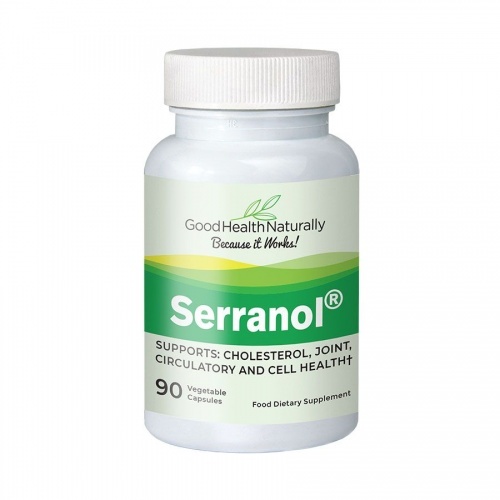 Good Health Naturally Serranol - Professional strength support for healthy joints, cells, heart, blood flow & circulation, and also healthy cholesterol. This unique formulation combines two anti-inflammatory ingredients Serrapeptase and Curcumin 95% with the strong calming effects of Ecklonia Cava and the immune boosting power of Vitamin D3. Read more below about these super nutrients. Curcumin is one of the best natural anti-inflammatory herbs that stimulates glutathione to protect cells and tissue from inflammation, and modulates the immune system. It has also been studied for its anti-bacterial, viral and fungal properties. For centuries, people throughout Asia have consumed Ecklonia Cava Extract, a specie of edible brown algae. Harvested from the coastal waters of Japan, Korea and China, all studies indicate ECE offers outstanding health benefits. Vitamin D3is critical to keeping your immune system strong. The cells that make up the immune system contain vitamin D3 receptors. If there is insufficient vitamin D3present to bind with receptors, immune cells become weak and cannot protect the body from infections. Vitamin D3 deficiency is quite common. Other Ingredients: Maltodextrin, Microcrystaline Cellulose, Dicalcium Phosphate, Magnesium Stearate. Take 30minutes before or 2 hours after food.